I'm a first cousin to the Staffordshire Bull Terrier of England. I'm told that the Bull Terrier is a cross between the Old Bulldogge of England (which is not the same dog as the Old English Bulldog) and the Fox Terrier. For some reason, the Americans wanted a taller dog with more defined features, so that's how I came to be. My breed was recognized by the AKC as a separate breed in 1936. I'm stocky, well-muscled and very strong. I have a broad head with strong jaw muscles that are quite obvious when I look into the mirror. I can scare off strangers, but I'm actually very loyal and enjoy pleasing my owner. My coat is short, so I don't need to go to the groomer or anything like that. I just need ordinary care, like helping me to keep my nails trimmed and driving me to the vet when it's time to get my shots. When fully grown, I am between 17 and 19 inches tall (43.2 to 48.3 centimeters) and I weigh between 40 and 50 pounds (18 to 22.5 kilograms). We have no American Staffordshire Terrier Breeders listed at this time. 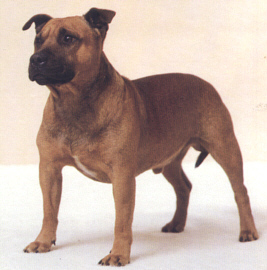 Click here to place your American Staffordshire Terrier Ad!